You Know “What,” We Know “How”; Want To Know More? There are three sides to any business process illustrated in the image to the left. There are things and services you buy, customers and the ways they buy from you and the employees and partners that keep your business growing and moving. Understanding how to analyze and adapt processes within this triad is critical to the growth of any business. 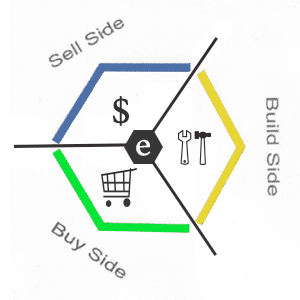 At Lexington Consulting, we begin the change process with the customer-facing side (the sell side). 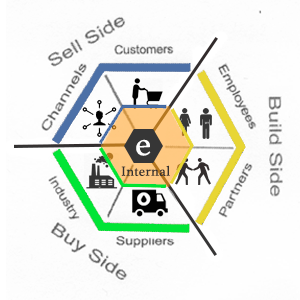 This makes it easier for the customer to do business with your company and acts as a driver to align internal processes with the external, customer-facing processes. We focus on the customer, first. Each facet of a trilateral business has 2 sides. You can’t get more customers if you ignore the channels they find you on. Likewise, you can’t support your customers effectively if you have a misaligned relationship with your suppliers, or don’t understand the key advantages your business brings to your industry. When we begin the change process, starting with the sell side, we consider each selling channel available, each potential channel you could use, and what makes sense to use for your business currently. We gauge the efficacy of your service to those channels and look for areas of improvement. During this process, we consider the potential impact on your customer and sales your business could generate on an ongoing basis. Further, we look for inefficient and/or ineffective formal processes where work piles up and burdens employees, and coping mechanisms (ad hoc processes) that compensate for deficient formal processes. We begin our analysis of the external sales processes with your staff, as they impact the customer most. Next, again with your staff, we align the internal with the external processes. Once these sales processes are running smoothly and effectively, we address the buy and build sides of the business in a similar manner, as needed. Initial contact is FREE! Let's discuss your needs and how we may be able to help. Does your team have what it takes to close the deal? Founded in 1990, Lexington Consulting has been helping commercial and industrial clients in aerospace, technical manufacturers and innovative engineering, navigate regulated industry requirements with accuracy and ease.